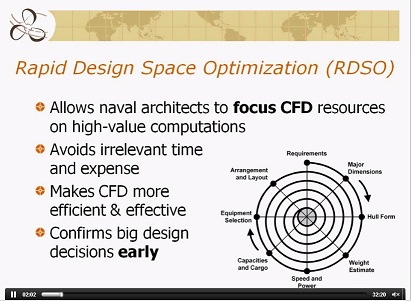 Rapid Design Space Optimization (RDSO) with HydroComp NavCad Premium allows a naval architect to focus CFD resources on high-value computations and avoid irrelevant time and expense. HydroComp NavCad® is internationally-recognized as the gold-standard for resistance and propulsion prediction for naval architects. With the recent introduction of the Premium Edition, NavCad is now able to provide integrated support for design optimization. To insure that overall process efficiency and cost-effectiveness of a design solution is as high as possible, it is necessary to make use of Rapid Design Space Optimization (RDSO) for early-stage design and to make CFD analysis more efficient and cost-effective. Coupled with a third-party application for administrative and optimization tasks, NavCad Premium is the ideal simulation solver for Rapid Design Space Optimization. The ship design process usually follows a path from a starting “parent” toward an optimized solution that meets certain design objectives. The set of all possible solutions is the design space. Design Space Optimization is simply the analytical narrowing of this limitless scope to the better solutions. NavCad Premium allows researchers and designers to rapidly find the target region of the design space – allowing them to evaluate more variants before switching to higher order and resource-intensive simulations. detailed design optimization by CFD or model testing is made more efficient and effective when predicated by knowledge from an initial RDSO study. The advent of more affordable and accessible CFD offers exciting possibilities for DSO in naval architectural offices – and one can make the optimization and analysis from CFD more effective by using NavCad Premium to “set the table” for it. A preparatory RDSO study establishes a starting geometry for CFD that is substantially closer to the final outcome, greatly increasing the success of analyzed designs and the value of CFD. In addition to quickly narrowing the design space, NavCad Premium can also be used to assign confidence and validate the CFD model. Its predictions are quantitatively very reliable and robust, allowing follow-on CFD prediction values (such as resistance or propulsor thrust) to be judged against the predictions generated by NavCad Premium during its RDSO investigation. To insure that overall process efficiency and cost-effectiveness of a design solution is as high as possible, it is necessary to make use of Rapid Design Space Optimization. A NavCad Premium RDSO solution insures that a company’s potent CFD resources start with the best initial “parent” and can therefore focus on detailed optimization and validation of results. November 10, 2015 – 11:15AM EST – Click here to view this free recorded webinar. HydroComp’s technical director, Don MacPherson, presents how NavCad Premium can be used to quickly and efficiently narrow the design space, allowing for naval architects to focus computationally intensive CFD resources on high-value simulations. In this webinar, NavCad Premium is used with Excel to evaluate and optimize a bulbous bow for retrofit on an existing vessel. Join us to explore how NavCad Premium and scripting can be used to automate batch calculations and rapidly explore the design space. Watch the webinar here!.